It’s only a week until Christmas and I’m starting to get excited! 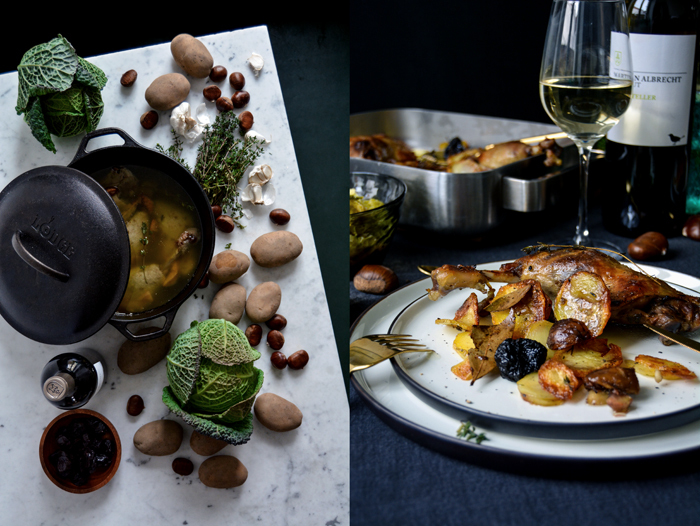 The culinary plan for our two delicious days isn’t complete yet – for the 24th, which is my German Christmas, and for my boyfriend’s special day on the 25th . There are still a few open questions to discuss but we’ll definitely have a flambéed Christmas Pudding for dessert on one of these days and also my obligatory slow roasted duck. 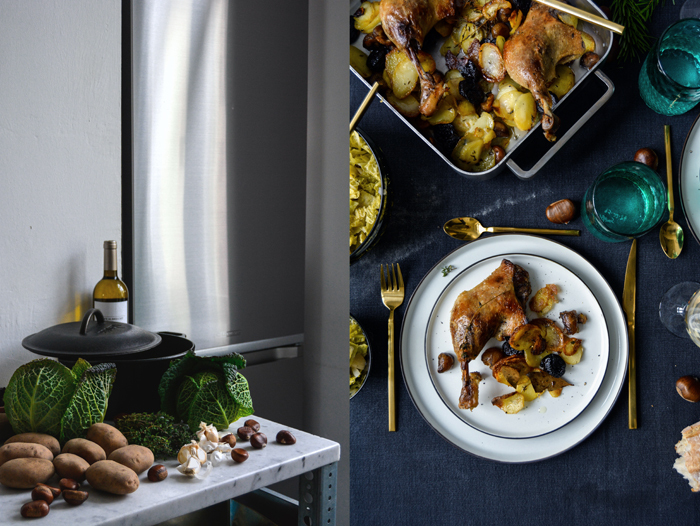 In the past 2 years of eat in my kitchen, I shared 2 Christmas recipes with you that feature a whole duck cooked for hours at very low temperature. This year, I decided you deserve a break – although I’ll still put mine in the oven next Wednesday – at 85°C / 185°F, as always. 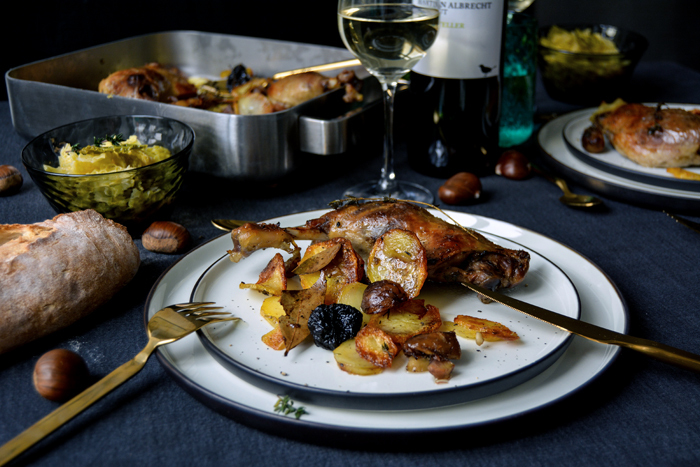 Recently, I had another one of my food phone calls with my mother, we spoke about confit de canard, duck legs cooked in the oven for hours in a dutch oven full of the bird’s fat. The meat is succulent and meltingly tender and – conveniently – you can use the fat that it cooked in for months to fry potatoes and sear your meat. It’s the best! 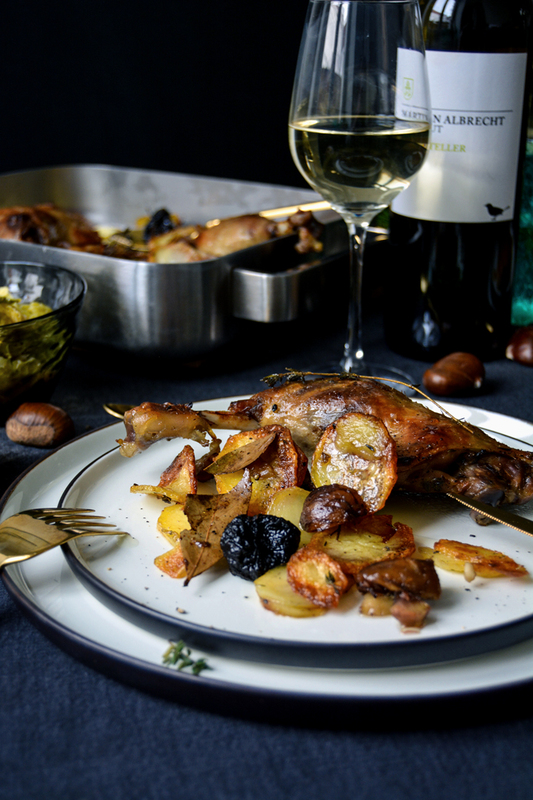 I decided to have a little pre-holiday-celebration and cook a Christmas-y duck confit roasted on crispy potatoes refined with chestnuts, dried plums, and star anise. Although the duck legs don’t need as long as my whole Christmas duck, you’ll need about 1 1/2 days in advance for the preparation. First, you marinate the meat in salt and herbs for a few hours, or preferably overnight. The next day, you’ll cook the legs in the oven in 1kg / 2 1/4 pounds of duck or goose fat (for 4 legs), I used goose fat as I forgot to place my order at the butcher in time but it works just as well. It takes about 2 1/2 hours before the meat almost falls off the bones – it’s beautifully tender but pale at that point. 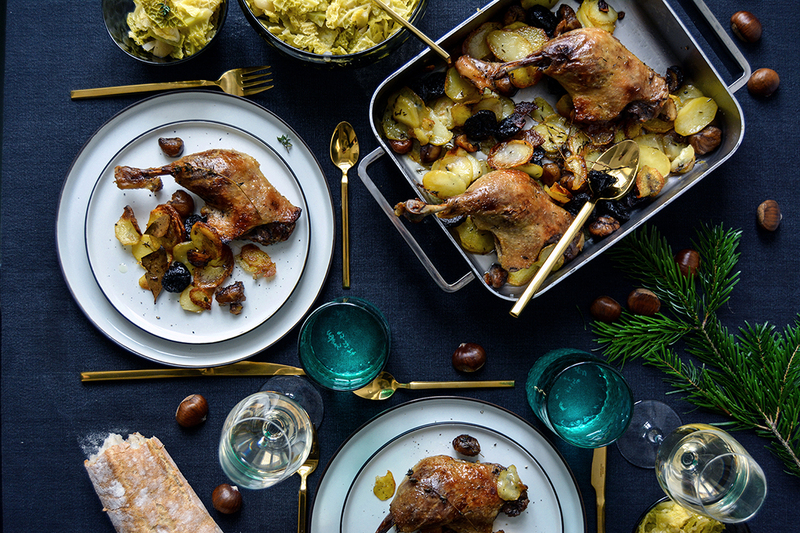 Now, you can either keep the duck confit in the fridge until you’ll need it – you could even store it for months as long as it’s completely covered in fat (although I have never tried that). Instead, I would turn the oven on the next day, lay the legs on top of thinly sliced potatoes and roast everything for about 30 minutes (plus 20 minutes for the potatoes before you lay the meat on top). You use some of the tasty fat – that you’ll have plenty of – to cook the duck and vegetables to crisp and golden brown perfection. During this time, I cooked a bowl full of apple Savoy cabbage, fresh and light without cream but with tender bite instead. 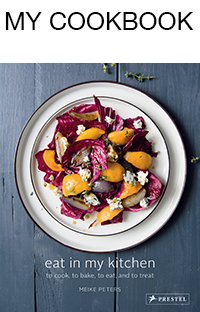 If you spread the preparation over 2 1/2 days it’s quite an easy Christmas lunch – or dinner – that doesn’t actually demand much work, just the right logistics. And if you’re still looking for some really good wine for Christmas, we already made our choice: We’ll enjoy Martin Albrecht‘s Gelber Muskateller (Muscat) and his 2012 Herbstnebel (Syrah, Cabernet-Sauvignon and Nebbiolo)! I wrote about his fantastic wine a couple months ago, click here to find out more about his old vineyards in the south of Germany. Apart from this culinary pre-celebration, there was also a pre-Christmas gift that I got overly excited about: we have a new fridge in the house! 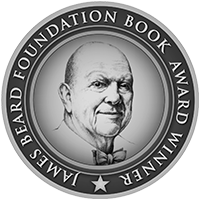 In the past few months, while cooking and baking even more than usual due to my book, I often suffered from my old fridge’s limitations and I knew that something had to change sooner or later. I did some research behind the silver doors of today’s chic refrigerators, which all look quite similar from the outside. I remembered a tall model by Samsung that had caught my attention last year but at that point, my 12-year old fridge was still fully functioning and I was still forgiving regarding its limitations. 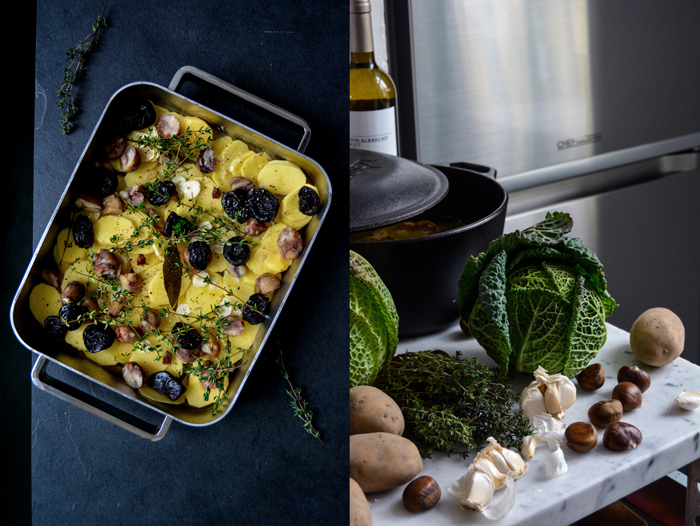 So when Samsung had invited me to a presentation of their latest Chef Collection, a series of kitchen appliances developed together with Michelin-starred chefs, I wasn’t ready for a change yet. 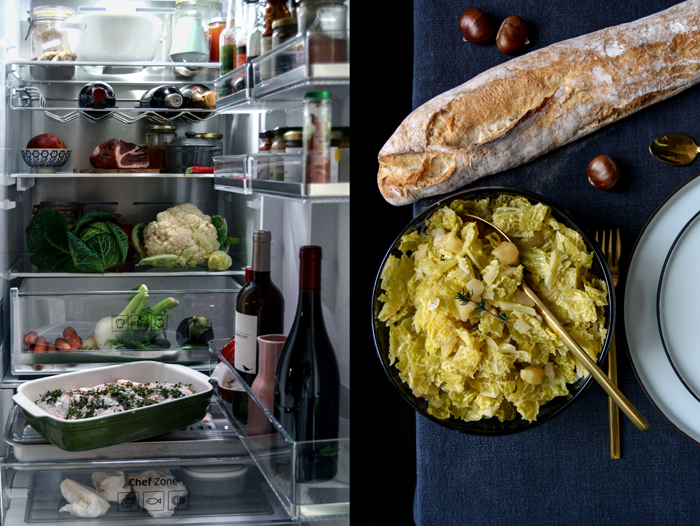 But as soon as they offered me this huge, elegant silver fridge, after months of trying to fit in all the vegetables that I needed to cook and shoot for my book, I said “Yes, please!” I got it – thank you so much for that Samsung – and I’m totally happy about the fact that it keeps the temperature constantly stable and is especially energy saving – and I particularly enjoy the telescopic slide out drawer at the bottom, the Chef Zone. Maybe this is how some people feel about cars, but these little details are more than just practical, this is fun! But first and foremost, it’s huge compared to our old fridge and I love it. There’s so much space that I haven’t even managed to fill it yet but I’m sure this will change next week, once the Christmas shopping begins. Day 1 – For the duck confit, combine the salt and pepper. Lay the duck legs in a baking dish, rub the skin with the salt-pepper mix and lay half the thyme under the meat and the other half on top. Cover with plastic wrap and keep in the fridge for a few hours, preferably overnight. Day 2 – Set the oven to 120°C / 250°F (conventional setting). Rub the salt off the duck legs with a paper towel, reserve the thyme sprigs. Melt the duck fat or the goose fat in a large dutch oven over medium heat. If you use goose fat, let it cook over medium-high heat for 1 1/2 minutes once the fat is melted. Take the dutch oven off the heat and let the fat cool for 2 minutes. If you use duck fat, let it melt over medium heat. 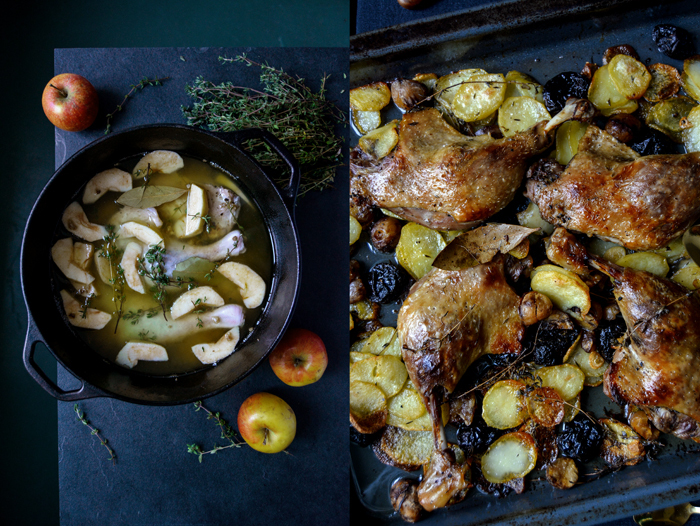 Add the duck legs, the reserved thyme sprigs, the apple slices and bay leaves, everything should be covered in fat. Place the pot, uncovered, in the oven and cook for 2 1/2 hours. Take the dutch oven out of the oven and continue roasting the legs or cover the dutch oven and roast the legs the next day. Once the duck legs are roasted you can pour the remaining fat in a sterilized jar and keep it in the fridge for months. It’s great for fried potatoes, roasts and cabbages. Day 3 – Set the oven to 220°C / 425°F (conventional setting). Spread the potatoes in a large baking sheet (don’t use a small baking dish like in the picture below, I had to transfer them to a bigger sheet after 10 minutes as they were too moist). Add the chestnuts, plums, garlic, star anise, thyme, and fat, season with salt and pepper, and toss to combine with your fingers. Roast for 10 minutes, stir, and roast for another 10 minutes. 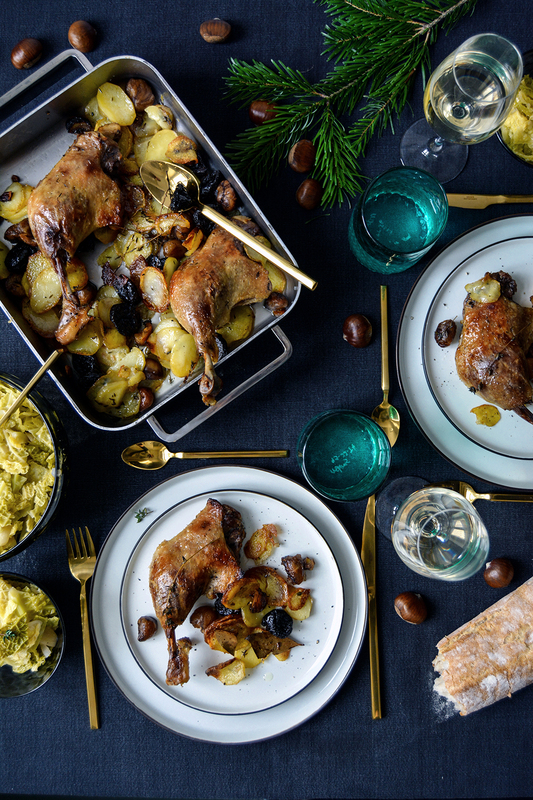 Take the duck legs out of the fat – if the fat is hard place the dutch oven over medium heat to soften it – and lay them on top of the potatoes, skin side up. Roast in the oven for 25-30 minutes, stirring the potatoes every 10 minutes, or until crisp and golden brown. While the potatoes are roasting, cook the cabbage: In a large pot, heat the fat over medium-high heat. Add the onion and cook for a few minutes until soft and golden. Add the cabbage and apple, stir, and cover. Lower the heat to medium and cook for 1 minute. Add the wine, nutmeg, salt and pepper and cook for 10-15 minutes or until the cabbage is just tender. Season to taste. 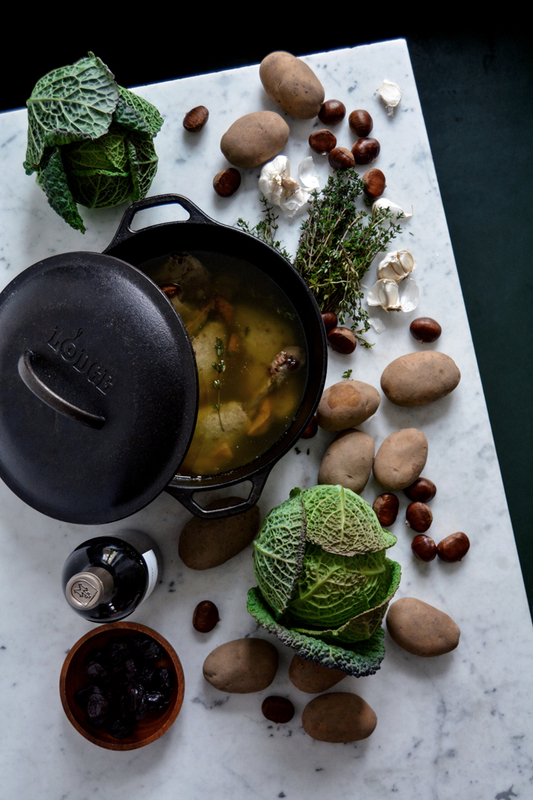 Arrange the duck legs and the potatoes on plates, serve with the cabbage filled in little bowls.